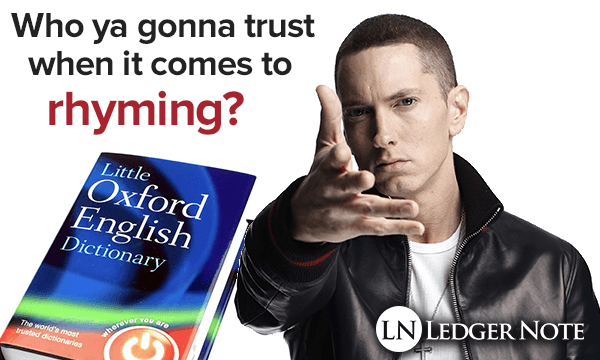 Will the real Slim shady please continue to defy the laws of the English language? There's a common belief that you can't rhyme anything with the word orange. It's one of those old wive's tales that isn't technically true, but it's fun to stump kids with. Many writers over the years have scratched their heads trying to figure it out, mostly just making up words in the process. According to the Oxford English Dictionary, there is infact one word that directly rhymes with orange but it's only because it's basically the word orange already with a couple letters added in front, and that word is "sporange". "in botany, the case or sac in plants in which the spores, which are equivalent to the seeds of flowering plants, are produced or carried." Anyways, Eminem isn't much of a botanist so he came up with some more commonly known words that can rhyme with orange. It's really just a matter of how you pronounce it, combined with his signature flow, that makes this work. On paper, it wouldn't be so smooth. A broke school teacher who goes by the book would give you an F- for turning in these rhyme schemes, but I'm going to go ahead and declare one of the world's richest rappers the authority on the matter. Never one to be bound by the oppression of a dictionary or some stuck-up teacher, Eminem shows off how many words he's able to rhyme with orange, and makes it look easy in true Eminem fashion. Well, wasn't that special! Mad props to Genius, the lyric analyzers, for putting the video together. The last example here is the most significant since he doesn't use multisyllabic rhyming to make it work, it's just the word orange on it's own. But like I mentioned earlier, it really comes down to pronounciation since you'd never look at the words "Ford engine" or "syringe" and think they rhyme with "orange". There's only one perfect rhyme with our word in question, but Eminem has proven that exact rhymes just limit you as an artist. Almost every rapper uses what are called lazy rhymes, slant rhymes, or indirect rhymes, which all refer to matching syllables loosely on how they sound. And that's where accent and dialect comes in. Nothing cracks me up more than when Houston rappers manage to rhyme the words north and house together. Have your doubts if need be... just don't voice them in front of B-Rabbit, best freestyle battle rapper in 8 Mile!